The Q400 performs high sensitivity mechanical measurements over a wide temperature range. The Q400EM is the industry’s leading research-grade thermomechanical analyzer with unmatched flexibility in operating modes, test probes, and available signals. 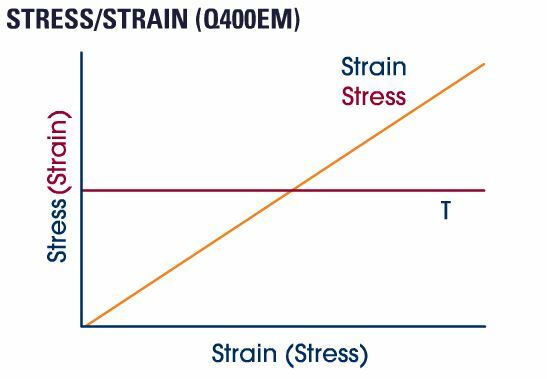 The Enhanced Mode (EM) allows for additional transient (stress/strain), dynamic and Modulated TMA™ experiments that provide for more complete viscoelastic materials characterization plus a way to resolve overlapping thermal events (MTMA). The Q400 delivers the same basic performance and reliability as the Q400EM but without the latter’s advanced features. It is ideal for research, quality control, and teaching applications. A thermomechanical analyzer measures sample dimensional changes under conditions of controlled temperature, time, force, and atmosphere. Our engineering experience in design and integration of critical furnace, temperature, dimension measurement, and atmosphere-control components meld with powerful, flexible software to optimize the numerous tests available which the Q Series™ TMA can perform. The Q400 vertical furnace is designed for high performance, reliability and long life in a wide variety of applications. Customized electronics provide the temperature control and response required for superior baselines, enhanced sensitivity and Modulated TMA™ operation. Software control of the furnace movement ensures operational convenience and simplified sample loading/unloading. The Inconel® 718 Dewar atop the furnace allows continuous operation in cyclic heating/cooling studies using the optional mechanical cooling accessory (MCA 70). The easily accessible stage simplifies installation of the available probes (see Modes of Deformation), sample mounting, and thermocouple placement. An integral digital mass flow controller meters the flow of purge gas to the sample area. 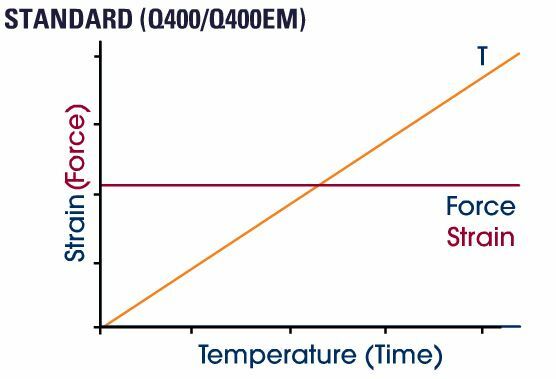 Precise and responsive temperature control and the well-regulated purge gas result in optimized performance in the standard and MTMA modes of operation. The design benefits also include flexibility in operation and ease of use. A non-contact motor provides a controlled, friction-free, calibrated force to the sample via a probe or fixture. The force is digitally programmed from 0.001 to 1N, and can be increased manually to 2 N by addition of weights. The motor precisely generates the static, ramped or oscillatory dynamic forces necessary for quality measurements in all deformation modes. Ten individual frequencies are available for optimizing data quality in dynamic TMA experiments in compression, 3-point bending, or tension modes of deformation. 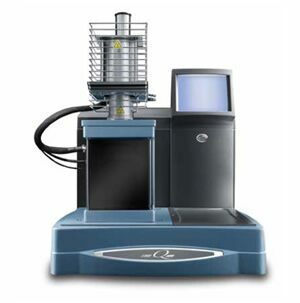 The heart of the Q400 TMA sample measurement system is the precision, moveable-core, linear variable differential transducer (LVDT), which generates an accurate output signal that is directly proportional to a sample dimension change. 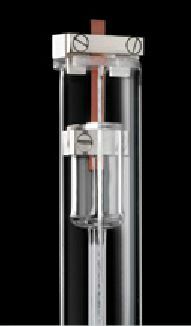 Its precise and reliable response over a wide temperature range (-150 to 1 000˚C) ensures reproducible TMA results. Its location below the furnace protects it from temperature effects and ensures stable baseline performance. TMA measures material deformation changes under controlled conditions of force, atmosphere, time and temperature. Force can be applied in compression, flexure, or tensile modes of deformation using specially designed probes. 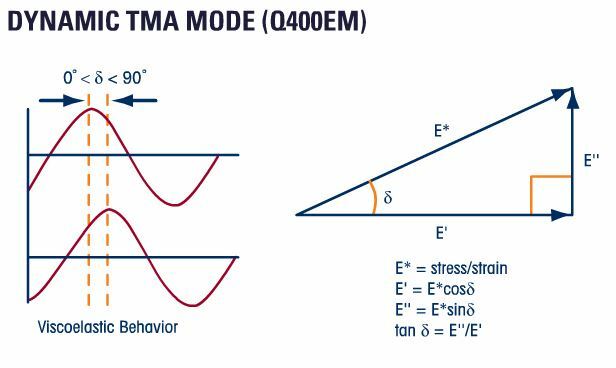 TMA measures intrinsic material properties (e.g., expansion coefficient, glass transition, Young’s modulus), plus processing/product performance parameters (e.g., softening points). These measurements have wide applicability, and can be performed by either the Q400 or the Q400EM. The Q400 and Q400EM operating modes permit multiple material property measurements. 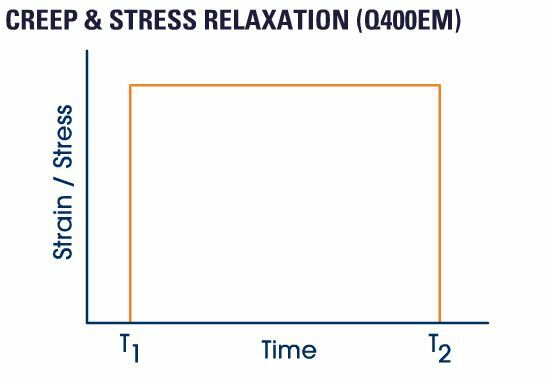 The Q400 features the Standard mode, while the Q400EM additionally offers Stress/Strain, Creep, Stress Relaxation, Dynamic TMA, and Modulated™ TMA modes as described below. Temperature Ramp: Force is held constant and displacement is monitored under a linear temperature ramp to provide intrinsic property measurements. Isostrain (shrinkage force): Strain is held constant and the force required to maintain the strain is monitored under a temperature ramp. This permits assessment of shrinkage forces in materials such as films/fibers. Force Ramp: Force is ramped and resulting strain is measured at constant temperature to generate force/displacement plots and modulus assessment. Stress or strain is ramped, and the resulting strain or stress is measured at constant temperature. Using customer-entered sample geometry factors, the data provides both stress/strain plots and related modulus information. In addition, calculated modulus can be displayed as a function of stress, strain, temperature, or time. TMA can also measure viscoelastic properties using transient (creep or stress relaxation) tests. These require the Q400EM module. In a creep experiment, input stress is held constant, and resulting strain is monitored as a function of time. In a stress relaxation experiment, input strain is held constant, and stress decay is measured as a function of time. The data can also be displayed in units of compliance (creep mode) and stress relaxation modulus (stress relaxation mode). In Dynamic TMA (DTMA), a sinusoidal force and linear temperature ramp are applied to the sample (Figure A), and the resulting sinusoidal strain, and sine wave phase difference (δ) are measured (Figure B). From this data, storage modulus (E’), loss modulus (E”), and tan δ (E”/E’) are calculated as functions of temperature, time, or stress (Figure C). This technique can be useful in the analysis of thin polymer films. 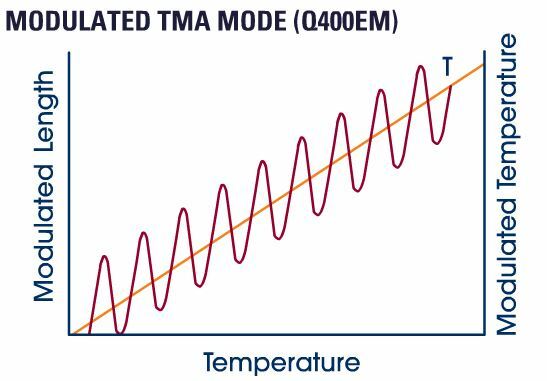 In Modulated TMA (MTMA), the sample experiences the combined effects of a linear temperature ramp and a sinusoidal temperature of selected amplitude and period. The output signals (after Fourier transformation of the raw data) are total displacement and the change in thermal expansion coefficient. Both can be resolved into their reversing and non-reversing component signals. The reversing signal contains events attributable to dimension changes and is useful in detecting related events (e.g.,Tg). The non-reversing signal contains events that relate to time-dependent kinetic processes (e.g., stress relaxation). This technique is unique to the Q400EM. In this mode, the sample is subjected to either a static, linear ramp, or dynamic oscillatory force, while under a defined temperature program and atmosphere. Sample displacement (strain) is recorded by either expansion/penetration experiments and used to measure intrinsic material properties, or by dynamic tests and used to determine viscoelastic parameters, detect thermal events, and separate overlapping transitions (MTMA). 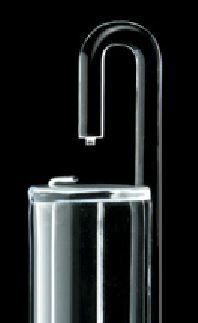 Expansion measurements determine a material’s coefficient of thermal expansion (CTE), glass transition temperature (Tg), and compression modulus. A flat-tipped standard expansion probe is placed on the sample (a small static force may be applied), and the sample is subjected to a temperature program. Probe movement records sample expansion or contraction. This mode is used with most solid samples. The larger surface area of the macro-expansion probe facilitates analysis of soft or irregular samples, powders, and films. Penetration measurements use an extended tip probe to focus the drive force on a small area of the sample surface. 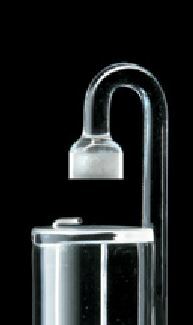 This provides precise measurement of glass transition (Tg), softening, and melting behavior. It is valuable for characterizing coatings without their removal from a substrate. The probe operates like the expansion probe, but under a larger applied stress. The hemispherical probe is an alternate penetration probe for softening point measurements in solids. In this bending deformation (also known as flexure), the sample is supported at both ends on a two-point, quartz anvil atop the stage. A fixed static force is applied vertically to the sample at its center, via a wedge-shaped, quartz probe. This mode is considered to represent “pure” deformation, since clamping effects are eliminated. It is primarily used to determine bending properties of stiff materials (e.g., composites), and for distortion temperature measurements. Dynamic measurements are also available with the Q400EM, where a special, low-friction, metallic anvil replaces the quartz version. Tensile studies of the stress/strain properties of films and fibers are performed using a film/fiber probe assembly. An alignment fixture permits secure and reproducible sample positioning in the clamps. Application of a fixed force is used to generate stress/strain and modulus information. Additional measurements include shrinkage force, Tg, softening temperatures, cure, and cross-link density. Dynamic tests (e.g. DTMA, MTMA™) in tension can be performed to determine viscoelastic parameters (e.g., E’, E”, tan δ), and to separate overlapping transitions. A specialty dilatometer probe kit is also available for the Q400 and Q400EM. 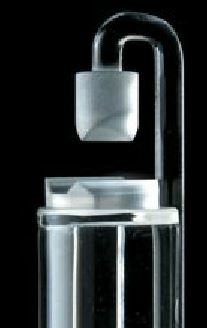 This kit includes a special dilatometer probe, small quartz vial to enclose the sample and a filling medium. Whereas TMA generally measures the linear Coefficient of Thermal Expansion (CTE), the dilatometer kit is designed to determine the Coefficient of Volume Expansion, or CVE, of a material. The expansion, macro-expansion, and penetration probes are supplied with the Q400. These probes, plus the flexure probe, and the low-friction bending fixture, are included with the Q400EM module. Data analysis programs relevant to each of the measurements described are provided in our Advantage™ software.